Whenever I talk to someone about gardening and ask about what they grow, more often than not they grow tomatoes. Again, more often than not, they will most likely say that its so much better than the ones you buy in the store or #ohmygoshyouhaven’ttriedatomatoifyouhaven’ttriedhomegrown. For me personally, I don’t quite like raw tomatoes. There’s something about that umami saltiness, coupled with a distinctive smell that I simply can’t handle when eaten raw. Cooked tomatoes are OK though. So because I don’t HATE tomatoes altogether, I thought I’d have a go at growing them to see what all these people were crapping on about. Impulsive me bought a tomato plant this year to see how it would fare in our garden. Surprisingly it did very well – I dug into the garden bed a few scoops of well rotted cow manure and planted the plant. From then on I sprinkled a bit of Dynamic Lifter around the base and made sure I watered it in a consistent matter – that is – every other day. The plant has flourished and in that flourish produced a good harvest of fresh tomatoes. I left them on the vine as long as possible until they turned a nice, deep and even red. 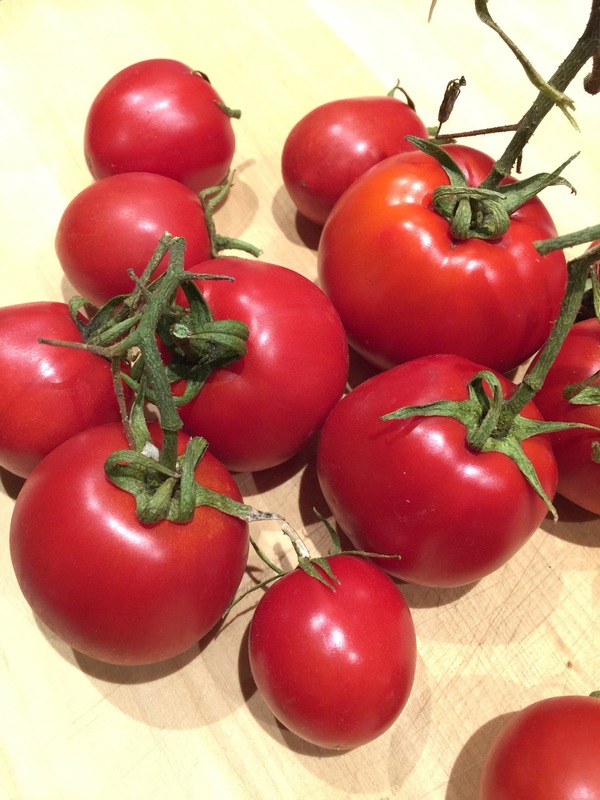 That’s not true for all varieties by the way – Heirloom tomatoes are best harvested when still slightly green. Anyway – to get to the point, I immediately cut up a small tomato, clamped my nose shut with my index finger and thumb to prevent gagging and placed a piece of this fresh, off the vine tomato in my mouth. I started to chew. I was surprised. What everyone said was right. The tomato was so sweet. It was almost as sweet as biting into an apple. I let go of my nose and smelt the taste (if that makes sense). It wasn’t as bad as I had imagined but I will still need to get used to it. It was definitely delicious and far better than the ones you buy in the shops. I still wouldn’t go eating it like a fruit because that idea grosses me out, but if they are slightly cooked and eaten with other ingredients I would never go back to store bought again if I could help it. Imagine using home grown tomatoes to cook regular dishes – there would be a definite marked improvement on the overall flavour of the dish, especially where they are one of the main ingredients. 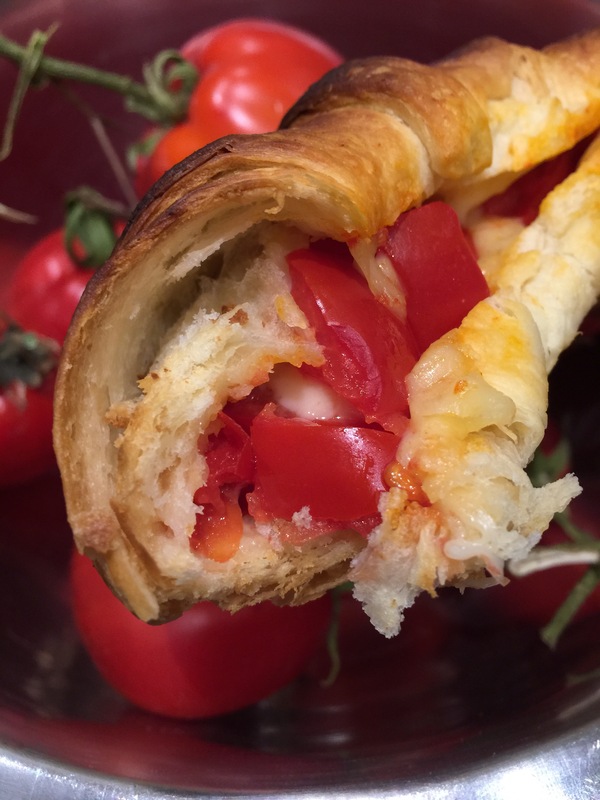 In terms of eating, the first thing I could think of to make (which didn’t involve too much cooking) was a stuffed tomato and cheese croissant – and I did just that. Unfortunately I still haven’t discovered a way to make a stuffed tomato and cheese croissant look attractive in photo – this is the best I could do. I always use Jarlsberg when pairing with tomato because it has that thicker cheese integrity and stringiness when melted, coupled with a very sharp and distinct cheese flavour. All I do is roughly chop the tomato in small pieces and tear the Jarlsberg slices into small bits. I then mix it all together and stuff it in the croissant. Finally, I place the croissant in a low oven to let the cheese melt and tomatoes partially cook through. The croissant itself goes crispy and flakey. This is the result and it is yum-O!